As price pressures increase due to global competitiveness, productivity remains the key focus for successful manufacturers with 100% quality assurance its Holy Grail. Machine vision, with its ability to pinpoint the most minute defect or flaw, has long been considered a means for achieving higher quality and therefore, greater productivity. The CoaXPress standard has made this promise a reality for larger manufacturers across a spectrum of industries in high-end inspection applications. CoaXPress or “CXP” has become a leading standard for high-end machine vision, and in such diverse fields as life sciences, security, and defense where use of coaxial cable is prevalent. CXP delivers high-speed asymmetric serial data over a maximum 100-meters of standard 75-ohm coaxial cable. It supports speeds up to 6.25Gbps, although the use of multiple cables allows scaling of bandwidth to meet the needs of a specific application. Additionally, CXP supplies power to the camera via PoCXP, plus controls the camera — all over the same coaxial cable. One of the driving forces behind CXP’s rapid adoption within the machine vision ecosystem is that it allows for the re-purposing of coaxial cable in existing analog systems, therefore providing a cost-effective, trouble-free migration to faster, higher resolution digital processing. A user can replace just their analog camera and frame grabber to gain CoaXPress transmission rates. CXP’s additional bandwidth gives virtually any vision application the firepower to handle faster production runs and perform finer inspections. The next generation of CXP, CoaXPress 2.0, promises much more. The final draft of CoaXPress 2.0 will be ready by the fourth quarter of 2017 with the first certified products expected at the end of this year or early 2018. Central to this updated standard is the unprecedented speed to achieve blazingly fast frame rates and larger camera resolutions. CoaXPress 2.0 extends data transfer rates to an unheard of 10 Gbit/s (CXP-10) and 12.5 Gbit/s (CXP-12) per connection from the existing standard’s 6.25 Gbit/s maximum data transfer rate support. Consider this: With only two cables and CXP-12 connections, maximum data transfer rate is 25 Gbps, or 2.5 GByte/s. That will operate a 10-bit 12-megapixel area-scan sensor at more than 150 images per second, or an 8-bit 16k line-scan sensor at 150 thousand lines/s. Because the amount of data may exceed the host PC’s processing power, CoaXPress 2.0 supports the distributing of camera data to several PCs in parallel, permitting them to delegate the workload. Uplink speed is doubled for both CXP-10 and CXP-12, making it possible for trigger rates exceeding 500kHz without a dedicated high-speed uplink cable. Greater speed translates into enhanced flexibility in system design, and in the reduction of total system costs. For example, by requiring only one CXP-12 connection instead of two CXP-6 connections, fewer cables are needed. Or consider the widely-used “Camera Link Full” configuration. Full configuration of Camera Link provides a bandwidth of only 850MB/s. CXP-10 exceeds that requirement, allowing for the swapping out of two complex and expensive Camera Link cables with a single coaxial cable. 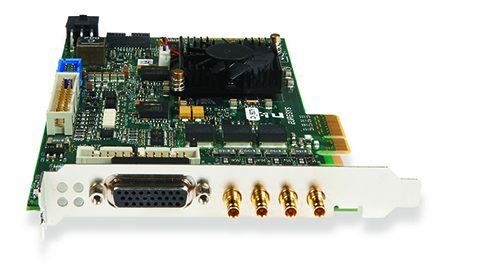 It will also reduce the number of PCIe slots needed for frame grabbers in multiple camera applications while helping to lower the cost of such accessories as CXP repeaters, split boxes, and cables. One of the biggest challenges in developing CoaXPress 2.0 requirements was doubling the bandwidth yet maintaining its support of long coaxial cable runs. Amazingly, the 12.5 Gbps bandwidth does not limit CXP’s 100-meter cable length, as was the case with other high transfer speed standards, such as USB3 that relies on passive cable lengths of two meters or less. CoaXPress 2.0 perserves the 100-meter maximum length without deploying repeaters that can negatively impact signal integrity.